Welcome to the first ever official Anni-VERVE-sary Blog Hop. Verve turns two today and we’re celebrating with a hop, hop, hop! The party kicked off over on the Verve blog, so if you’ve just happened along, be sure to hop on over there to start from the beginning! And to make this party a real shindig, there’s a mystery jackpot hidden at one of the stops along the hop. One lucky commenter on that blog will win Verve’s entire August release! But of course, it wouldn’t be a mystery if you knew which blog, would it? So if you’re feeling the love, give a little shout out to the bloggers in the hop and you just might have a reason to jump for joy! For my card I used one of my favorite sets~ (ok they are all my favorite lol!) Kindred Spirits. I stamped the oval image twice, once on Kiwi Kiss and once on white with Versafine Onyx Black ink. I stamped the cluster of fleur de lis' with Kiwi Kiss, and the sentiment over the top. I cut out the oval part and popped it up over the Kiwi Kiss layer. I added some texture using my Argyle and Swiss Dots CB Folders. I also added a border of the fleur de lis' on the inside. That's pretty much it for me : ) Now it’s time to hop on over to Regina’s blog, for a little more Verve-y goodness. Thank you so much for stopping by! fleur de lis' is my favorite design item. I went crazy over it when I went to New Orleans on vacation. (It's the city symbol) Very Beautiful! Gorgeous, Love love the colors. Oooh gorgeous, those colors are amazing! Wow I love those colors - so beautiful! Love this card! Great layout! Thanks for sharing! Kerri, this is GORGEOUS!! The colors are beautiful!! I LOVE your color combo. Looks absolutely beautiful! Wow Kerri!! I love your design and the colors are gorgeous!! Wow! This is so cool! I love the colors, wonderful job! I never knew Kiwi Kiss could be so gorgeous! Fabulous job! You colors make the card so stricking and beautiful! Love the punched border and the jewels in the corner! That Kiwi kiss just jumps off the page! Love your fun and sassy card. Kerri, I just love this!!! That color combo is awesome! Dramatic and stunning color combination. You've inspiried me to purchase Kindred Spirits! Totally FABULOUS! This is my ALL time fav color combo with Verve stamps! AWESOME card!! Very elegant. I recently found your blog and really like it! So beautiful. Love the colors! Super colors. It looks rich! Beautiful card, and I like the CB embossing on this. The colors are wonderful. Gorgeous card!! Love all of your wonderful details!! Great layout and very dramatic colors! ok. first of all I gasped when I saw your kiwi kiss! It is one of my faves and I am completely out of it.. Now about that fabulous card! It is so full of wonderful texture and design.. and well, you just can't go wrong with kiwi kiss!! This is so striking. I love that color combo. What wonderful texture! Oh man, I love kiwi, especially with just black and white. This is so gorgeous, youthful and elegant. A difficult mix to achieve. Love the colors you chose. What a great card. Did someone already say gorgeous? Well I'll say it again then. ;) Love your card Kerri. Wow! That's one bright card...but I like it! Someone will get quite the eye opener when they see that in their mailbox! Love it! The fleur de lis' are perfect! Wow, fabulous card. Definitely a favorite. What a rich looking card - the recipient will be bowled over..
Oh wow! What a striking card! Beautiful. I love that edge punch, fleur de lis'. Great card!! Oooo - those colors together are HOT. That's Kiwi Kiss? It looks like it's got so much more POP -- really HOT. So pretty and elegant. I love the colors and how you stamped over the image in the oval - cool! These ROCK!!! Really luvin the colors! Oh, how I love this card! You used my fav Verve set and my favorite color. I'll be casing this one for sure! Love the color combo - oh how I will miss Kiwi! Your card is so well put together...everything matches just so. 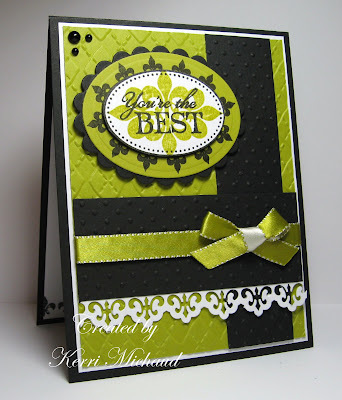 I love the green and black combo and the fleur de lis punch looks great with the stamp set. I love that set too Kerri!!! Your card is AWESOME!!! The colors are just perfect! WOW!! The colors are so striking!! Love it!!! oh, the colours are GREAT. And I love the layout. beautiful card! LOVE your colors and layout. wow! very striking colour combo. These colors are so cool! Love it! What a lovely job! I just love it! Very elegant and chic! Lovely work. Wow, what a great card! Love all the detailing! I am a huge fan of kiwi kiss and I love that color combo you used! Just a gorgeous card! Your card is fabulous! It's wonderfully put together with oodles of lovely details! I love love love this card. The colors just jump at you and say look at me. Great car. Verve Stamps are fairly new to me and I love them. I'm always excited to see something new created with them. Love your color combination...beautiful card! Love this card ~ very elegant. Very nice card. Great job. I totally love the colors you chose for your card! It has such a rich look to it. Gorgeous! WOW. I am so glad I did this. I love your card. Your work is amazing and I am so glad that I stumbled across your blog. Such an slegant card...well done! Your card really pops! Love that Fleur de Lis! Wow, kiwi kiss and black - stunning!!! What a delicious looking card. Those colors are amazing, and you did them proud. Thanks for sharing it with us. Jeanne's not ready so I am here! Love the card, unusual colours and the textures are great. Getting to be all my faves too! Thanks for sharing! Very nice card! I love the color combo! TFS. so cool and eye catching! Oh my gosh, I LOVE this card! The colors are fanTAStic together and I love how you stamped the focal image. Just gorgeous! Thanks for sharing! Fantastic card!!! love the colors!!! Lovely card! Thanks for sharing. I love the colors on this card and the ribbon. Now I'm going to have to order some.......lol Thanks for sharing. Love this colour combo and all of the texture. What a classic! Beautiful color combination and use of stamps. And the embossing adds a wonderful texture. too cool! Oh I love these colors! Love the color combination! Very nice card. Great layout, great colors, great detail = super card! Such a stunning card! Everything just clicks...awesome colors and layout. Great card!! Love the layout and color combo! love this card -- great colors!! Gorgeous card - love the green and black! These are not colors I would try on my own but I really like it! Thanks for expanding my world! Great colors. Love the border. Thanks so much. Loving it all. Love your card. Gorgeous!! Love the colors and all the details! What a fabulous colour combo!! Love this set too...just divine! Oooooo-la-la!! Wonderful color combo. So elegant and sophisticated! !